The cover is soft and beautiful, and the pile is light but warm. The queen is a very generous size that gives plenty of overhang. We are pleased! Took a few cycles to fully tumble dry but it washes well. 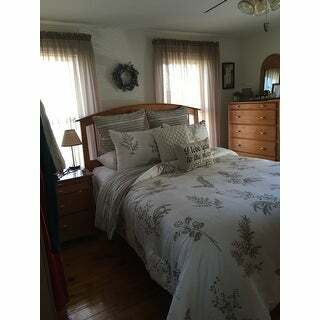 Update the look of your bedroom with the Stone Cottage Willow Cotton Comforter Set. This 3-piece set features a simple, contemporary style with a floral pattern in taupe with a striped reverse pattern. The fabric, stitching and sizing are superb. Soothing colors. The side with the fern/foliage pattern is a true taupe on white and the stripes on the other side are chocolate and taupe. Lovely in any decor style. I am really liking this comforter set. I don't seem to find many that are cotton and I really like that aspect of the comforter. Works in my room beautifully, so I am updating it throughout with new taupe paint and roman shades to go with the taupe. I would buy this again in a heartbeat! This comforter set is beautiful. We purchased matching shams that are gorgeous! This comforter is beautiful, warm, and large enough to cover my queen bed with plenty of overhang. I am very happy with it so far, and the light color brightened up my room, while the patterns on each side of the comforter add visual interest without being gaudy or distracting. This thing did have a decently strong synthetic smell for a couple days after I opened it. I was able to sleep with it anyway, and the smell disappeared completely within about 48 hours, but if the smell is going to bother you, you should probably open it away from your bedroom and let it outgas for a couple days before you sleep with it. It has synthetic fill and comes in a plastic bag, so it will need to release some of that stored up plastic odor. No big deal. Lovely bedding set. Purchased for a guest bedroom in my mountain house. Pattern and colors are prefect for my modern rustic decor. I’m pleased with the quality for the price. Have only had this comforter a few days, but so far am very happy with it. Love the size and material. Very soft right out of the package. It is kind of a kacki color with the striped side having more brownish tones. This is a nice set, though I'm a little worried about the batting being bunched up. Since it's completely sewn all the way around the comforter I'm not sure how I can unbunch it. Hopefully with time and a bit of shaking out it will resolve. The colors are about the same as in the photo, though in person the tan/green color is more of a tan color. I do like it as it gives my guest room the softness I was looking for. 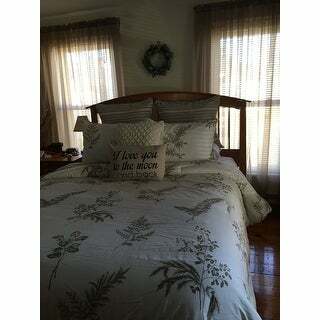 I love this comforter it held up well, warm and washed without shrinkage. Will be purchasing another. Awesome. Wonderful product, looks so pretty without frills. Very pleased. "Where can I buy the striped euro pillows? I can't find them!" "What is the difference between cream & taupe? And which color is appearing on the featured comforter? " "can you buy the striped large pillows shown in the picture? The ones behind the Shams?" "Is there a bed skirt available that goes with this set?" Pretty design. Not too busy. "I only see one color in the pictures. What is the difference between the Cream and Taupe?" The base is a cream color and the leafs are a brown-ish. It's a very nice set. When you reverse it becomes stripes. "Is it a comforter or duvet"
It is a comforter. i think it is also available as a duvet.